To create views for visualization, open the Views folder in the Project Window; the main toolbar will show you these options: Open View, Add View, Duplicate View, Delete View, Print View, and Show Used Tags. 1. Click on the Add View icon located above the main screen or use the command from the main menu Project->Views->New View. Parametric Window: option to create a parametric view – use parametric views when you need multiple views different only in a data source; such sources are specified by the received index when a parametric view is prompted (see Commands – Open command and Parametric window). 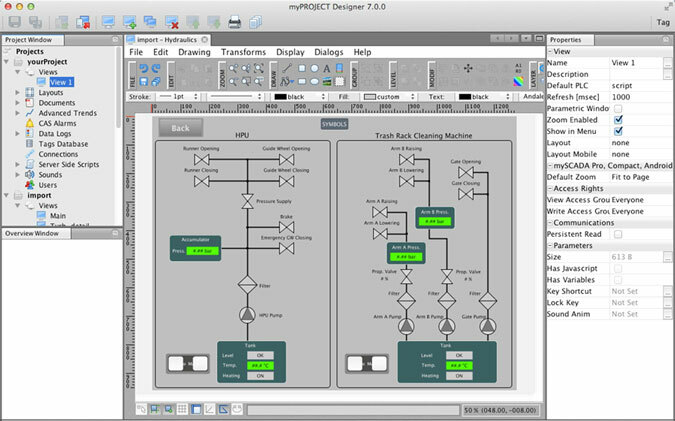 Connection: list of PLC connections defined in the current project. This is a default connection – if you enter the tag and do not specify the connection, this connection will be assumed as the default. Note: If your device uses a pop-up menu toolbar (iPhone, Smartphones, etc.) you can set up its width in pixels, and it will be automatically subtracted from the final screen size. Note: You can change the screen dimensions at a later time if you right-click on the canvas and select ’Resize canvas’ from the pop-up menu. 2. Click on Add to create a view with the selected parameters or press Cancel to exit without creating or saving the view. In the Project Window, you can see all the views listed in the Views folder. In the Properties window, you can see the parameters of the currently selected view. To open an existing view, simply double click on its name. You can also click on the Open View icon or on select Open View from the Project->Views menu. You may also use the other options such as copy, delete, import a view, etc. Print – prints the current file (shortcut Ctrl+P). Check – performs a check of your view; use this if you experience malfunctions, and it will check for possible duplicity of IDs, objects misplaced outside of the canvas, etc. Close – closes the current file (shortcut Ctrl+W). This menu provides basic operations like undo, redo, copy, cut, delete, group, lock, select, etc. Paste on the same location – pastes the copied or cut object to the same location as the source. In this menu you can create figures, lines, and curves; add pictures and texts; etc. It contains the same features as the main toolbar; for detailed information, see the toolbar section of this chapter. 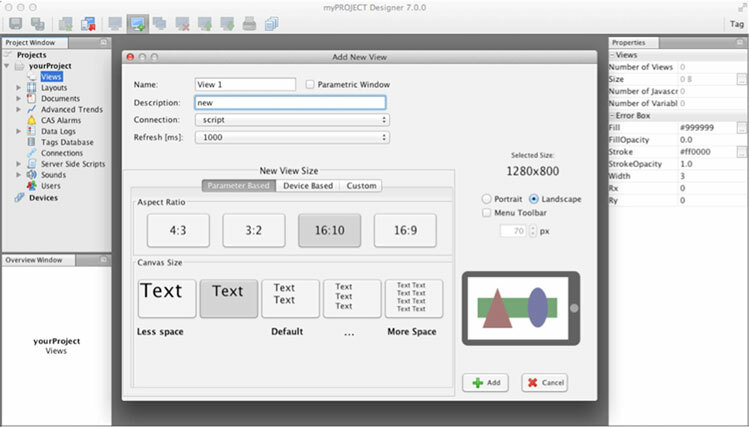 In this menu you can align, center, distribute, order, flip, and rotate objects and resize the canvas. This menu includes the Memory Monitor utility. This menu offers additional information about myDESIGNER. TIP: The most frequently used functions from these menus are also available in the main toolbar or in the right-click menu. In the upper part of the GUI editor window, there is a secondary GUI toolbar where you can find all of the necessary functions for designing and animating the views. This bar is located right below the GUI toolbar. 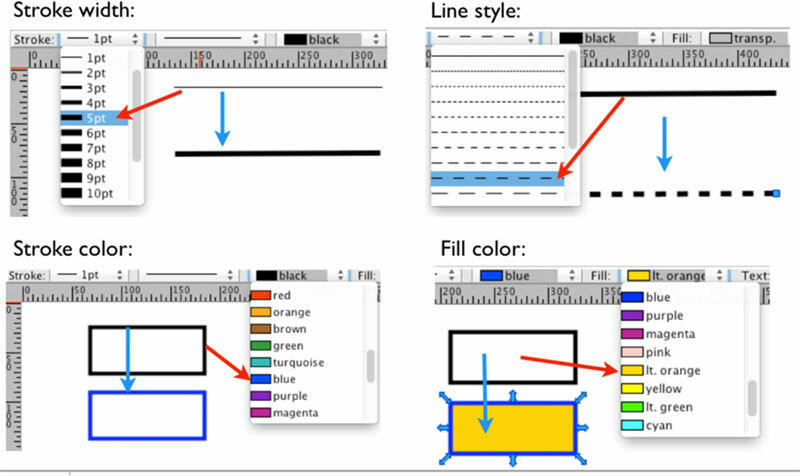 It allows you to view and change the properties of selected objects or set default drawing properties such as fill and stroke color; line type and line thickness; font family, type, and size. If there is no object selected, you can specify the default properties for new objects to be created. If you click on an existing object, you will see its current properties that you can modify. With the Properties bar, you can easily change the properties of multiple objects at once: stroke width, stroke style, stroke color, fill color, and also the font family and size. This bar is located in the left lower part of the Main window. Here you can activate the repeat action mode; turn on/off the smart guidelines, snap-to-points, and square mode function; enable the grid; set the discrete rotation step; force horizontal/vertical line drawing; and automatically close the drawn paths. Detailed explanations of each function will follow.